Step into a perfect combination of shaping and comfort! This open bust body shaper is made with our signature moderate compression DuraFit® fabric to comfortably shape your torso and thighs. At the end of the shorts-style bottom is a soft lace trim with built-in anti-slip grip lining for no roll-up. This shaper was built for comfort and ease of wear with super-light fabric, a step-in design (no hooks, no zippers), and a convenient open gusset. Plus it's made with ultra-flat seams, designed to be undetectable under your clothes. Fabric content: 70% polyamide, 28% elastane, 2% silicone. Interior lining: 57% polyamide, 43% elastane. 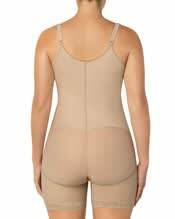 Everyday shapewear: This shaper is undetectable, even under your tightest dresses and pants. Plus, it's comfy enough to wear all day!